This is a tricky one. But isn’t it the tricky data sets that need to be visualized. So how do the U.S. and China compare, and who thinks so? This is the data you have before you today and I just wonder how you or your learners might use visualization to tell the story. 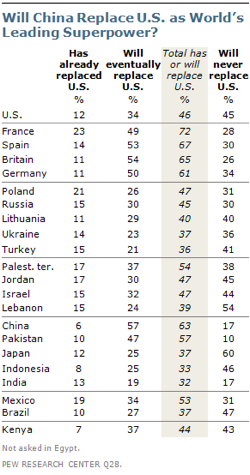 In most regions of the world, opinion of the United States continues to be more favorable than it was in the Bush years, but U.S. image now faces a new challenge: doubts about America’s superpower status. In 15 of 22 nations, the balance of opinion is that China either will replace or already has replaced the United States as the world’s leading superpower. This view is especially widespread in Western Europe, where at least six-in-ten in France (72%), Spain (67%), Britain (65%) and Germany (61%) see China overtaking the U.S.